Manavgat makes a popular day trip from Alanya, but many tours only make a brief stop. 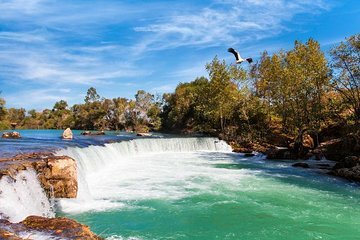 On this full-day tour, admire views of Manavgat falls, then set sail on a scenic cruise through the Manavgat delta, tuck into a delicious buffet lunch on-board, and enjoy free time to browse the stalls at the Manavgat bazaar. Hotel pickup and drop-off is included. Your tour begins with pick-up from your central Alanya accommodation. Traveling by air-conditioned coach, set out on the around 1-hour drive to Manavgat and head straight to the star attraction — Manavgat Falls. You’ll have free time to explore the viewpoints, take photos, and enjoy the natural wonder before continuing to Manavgat river pier, where your boat will be waiting for you. Set sail down the river, soaking up the scenery as you cruise through the delta, then stop to swim or sunbathe at a riverside beach. After a beach break, hop back aboard to re-fuel with a delicious buffet lunch, served on deck. Feast on typical Turkish salads, rice and bulgur dishes, and grilled fish or chicken, and accompany it with a cool beer or glass of wine (own expense; soft drinks and water are also available). After lunch, cruise back into Manavgat town and spend the rest of the afternoon browsing the stalls at the lively Manavgat Bazaar. Perhaps shop for souvenirs, relax at a local café, sample street food (own expense), or just enjoy the atmosphere of the lively street market, which is one of the biggest along Turkey’s Mediterranean coast. Back in Alanya, your tour ends with drop-off at your hotel. Please note: During beach break the on-board bar will be closed.